The fourth release from Gerry Dantone’s Universal Dice project is a sixteen song self-described rock opera entitled birth, love, hate, death. Despite his omnipresence as both a vocalist and songwriter, Universal Dice never comes off as some glorified solo vehicle. There’s no question that his musical collaborators exert tremendous effort in complementing his songwriting vision for the release and, even more impressively, do so without falling prey to any of the heavy-handed tactics lesser artists might have employed to explore Dantone’s themes and ambitions. There’s a breathtaking array of styles on birth, love, hate, death and they handle each one with the same amount of sure handed musicality. 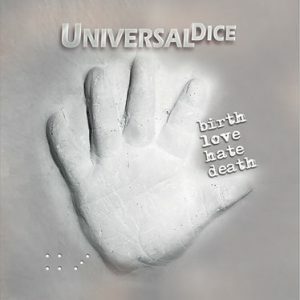 Much of birth, love, hate, death adheres to traditional rock music formulas, but Universal Dice definitely imprint each of the sixteen cuts with their own personality while still serving up something recognizable that many audiences will admire. “Welcome to the World” is about what you might think it’s about, but it’s never either too obvious or coy. Instead, it’s a relatively unassuming opening with a nice stride and a good mix between the rhythm section and guitars. Dantone has a vocal quality reminiscent of Tom Petty or Jakob Dylan, but the lyrical content doesn’t contain a lot of those aforementioned songwriters’ more poetic touches. Instead, Dantone’s writing aspires to a more conversational form of poetry and finds its mark with songs like this. “I Wish I Could Tell You This” covers its lyrical territory with a similar style, never affecting a pose, but the musical arrangement is clearly much more in a rock ballad tradition. Dantone and the band wear their influences on their sleeve; it isn’t difficult to imagine a song like this appearing on some seventies classic, but it also has a modern sheen that won’t remove it from a younger frame of reference. “The Prophet” has the hardest hitting drum track thus far on birth, love, hate, death and it sets a huge tone for the song straight out of the gate. These sort of intense rhythms make a number of songs on this album really pop and this stands among the first rank of such tracks. “My Hands Are Tied” is a bright, sparkling tune with a nice mix of athletic drums running alongside acoustic and electric guitar. Nothing is overstated here and the song, as a whole, is perfectly calibrated to breeze past the listener convincingly and gracefully. “Take Me Home” is the album’s longest track and has some ballad-like tendencies despite its relatively uptempo jaunt. Dantone and his collaborators definitely favor a certain pace for birth, love, hate, death’s tunes, but there’s never any real sense of repetition and the extended running time of this tune, clocking in at over six minutes, never feel exhaustive. “I Love It When They Hate It” is a good example of Dantone and Universal Dice’s talent for invoking classic rock clichés and poses without ever sounding too imitative and much of the credit for that here must be borne by the excellent production job elevating the entire album. “I’m No Good for You” takes a familiar sentiment in popular song and gives it an engaging new coat of musical paint with an energetic mid-tempo arrangement contrasting a strong acoustic guitar sound with authoritative drumming. “Sleeping Alone” is one of the album’s best tunes, anchored by beautifully played piano, and defines the album’s quiet final half in an uniquely artistic way. birth, love, hate, death has a long run at sixteen songs, but sticking with it isn’t hard and it proves to be a highly worthwhile experience.